DOHA: Almost a decade in the making, three years late and at an estimated cost of $434 million, Qatar’s vast national museum, built in the shape of a desert rose, opens this week, reports AFP. A glittering ceremony, expected to include Qatar’s ruler Sheikh Tamim bin Hamad al-Thani, Kuwaiti Emir Sheikh Sabah Al-Ahmad Al-Jaber Al-Sabah and French Prime Minister Edouard Philippe, takes place on Wednesday, with the doors opening to the public the next day. “Architecture to give a voice to heritage whilst celebrating (the) future,” tweeted the museum’s renowned French architect Jean Nouvel, also responsible for the Louvre Abu Dhabi. The pale, futuristic 52,000-square metre structure located on Doha’s waterfront corniche will be the first notable building visitors to Qatar see as they make their way from the airport to the city centre. 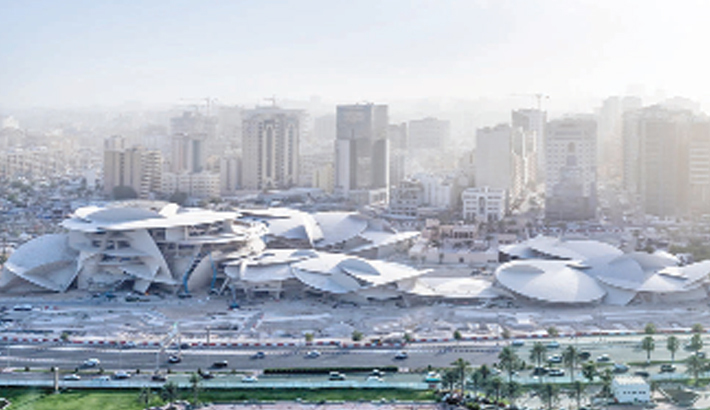 Even in a country which is being built, rebuilt and utterly transformed for the 2022 football World Cup, the national museum could be the single most eye-catching design of all Qatar’s new buildings. The entrance includes 114 fountain sculptures in a 900-metre long lagoon and the museum’s multi-curved roof, which resembles a giant jigsaw puzzle, is made up of 76,000 panels in 3,600 different shapes and sizes. “This is a museum that narrates the story of the people of Qatar,” Sheikha Amna bint Abdulaziz bin Jassim al-Thani, the museum’s director, has stated. The National Museum of Qatar also stands on the site of the former palace of Sheikh Abdullah bin Jassim al-Thani—son of the founder of modern Qatar. The palace has been restored as part of the massive project.